OUTSTANDING SEASON - Dawson junior pitcher Courtney Day pitched the Lady Eagles to the 2018 District 23-6A championship. PEARLAND — The Dawson Lady Eagles won their first-ever District 23-6A title this season and were expecting to go deep in the post-season. As the No. 1 seed from 23-6A, they were facing the No. 4 seed Clear Falls Lady Knights from District 24-6A in the opening round and were expected to get past this team in a best-of-three series. Everything was going as planned as the Lady Eagles rolled past Clear Falls in the first game 8-0 and were clearly in command. But as is the nature of athletics, you can never take another team for granted and Clear Falls took advantage of multiple errors by Dawson in the next two games to pull out the upset and end the season prematurely for Dawson. 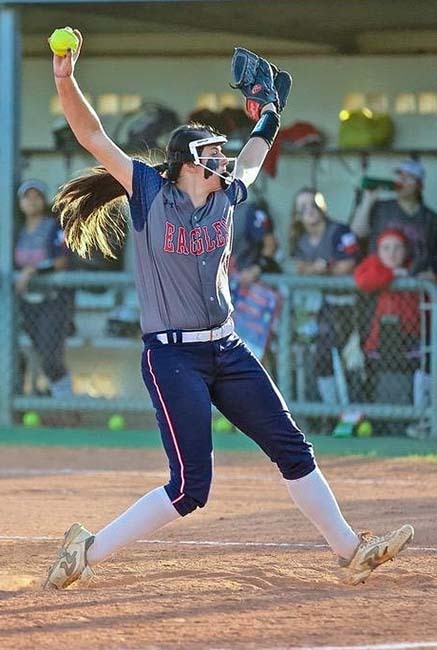 Dawson had no trouble with the Lady Knights in game one as junior pitcher Courtney Day blanked the Lady Knights and crushed a three-run home run in the second inning, leading the Lady Eagles to an 8-0 five-inning victory at the Clear Falls field. However, the Lady Eagles weren't so fortunate in Game 2 and 3 on their own home field as the Lady Knights weren't going to go down without a fight. "I was worried coming into this game because we played Clear Falls in a tournament and we beat them easily," Dawson head coach Katelyn Welch said. "Last year, we were in that exact same position with Alvin…and Alvin creamed us in College Station. "Then we came back and swept them in the playoffs as a No. 4 seed. We really pushed that to the kids that from here on out, any team can show up and any team can win these ballgames." Dawson (20-9) saw its season come to an end by losing a doubleheader at home to Clear Falls after taking a 1-0 lead in that best-of-three series. The Lady Knights won the first game 4-1, scoring three times in the seventh inning. Chelsi Olvera and Erica Riley each came up with key run-scoring hits. Pitcher Ashlyn Strother worked seven innings, allowing just two hits while striking out seven. In the second game of the doubleheader at Dawson, Olvera provided the game-winning hit with a two-out double to bring home Katie Hoke, who had singled in the top of the fourth for the 3-2 win. Dawson's two runs came in the bottom of the third after Brooke Toler and Kirsten Williams each singled. Following a sacrifice bunt, Peyton Ellerman and Kyra Lunford each followed with run-scoring singles to tie up the game 2-2.